Thank you for the photos of the cosmos. They are even more spectacular “live”! Fabulous , fabulous glass ceiling ! One I don’t want to break ! It’s an odd feeling standing underneath it! I have done so in Atlantic City and I also loved it ! Thank you so much for your comments – the layout grew over a year! “Bored” meetings, makes you want to do something silly, eh? More beautiful than the wallpaper version I have on my laptop! Perfect subject for layers. Thank you – feel free to replace your wallpaper with mine! Just tell everyone where you found it! Glad I could whet your appetite! Oh gosh, this is SO gorgeous! Is it colored glass on a table top?? Anyway, I love it. Thank you – glass brings out the best in colour! This reminds me of the ceiling in the lobby of the Bellagio in Las Vegas! 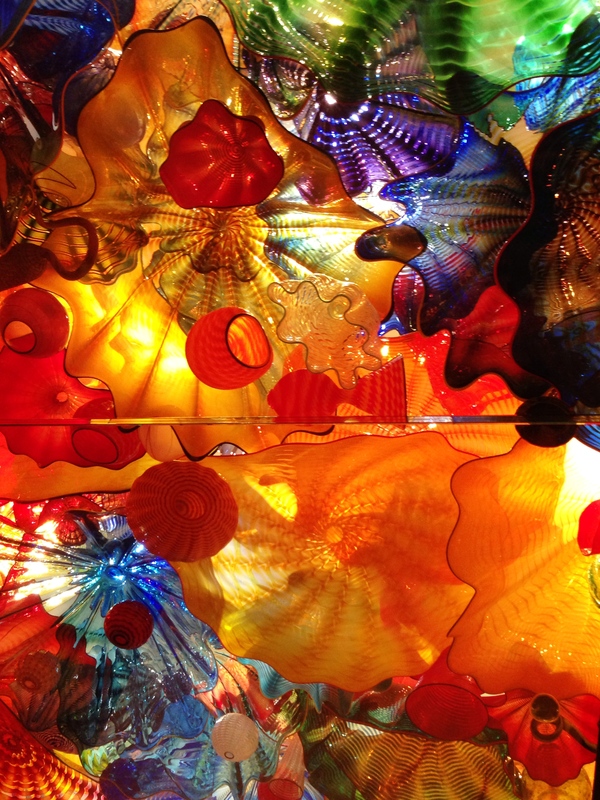 It, too, has these glass flowers — over 2,000 of them! Beautiful! Makes you wonder whose job it is to dust them…. Our big question was about the shipping/assembly of such installations, for it is a travelling exhibition… Not something you’d rely on FedEx for! Never even thought about traveling exhibits! Wouldn’t want to be responsible for this artwork! beautiful. was this shot in las vegas? i had seen similar glass designs over there. An exhibition in Montreal by the same artist! A great response to the challenge. I love the colours. Thanks – I would hate to have been the guy placing them!